Furthermore I used my own implementation and an implementation that’s hardcoded by hand. The Eclipse project with the sample code for this post can be downloaded as tar.gz or zip or can be viewed online here. Obviously there’s no problem with all the created objects: the by hand implementation just consists of the created objects and some method calls to copy the properties. This seems to be pretty fast compared to the other solutions. For example: the by hand implementation beats Dozer by a factor of 970, i.e. it’s 970 times faster. The results can be explained with the different richness of features. My Introspector and the implementation from the Springframework have very few features and are pretty fast. The Commons BeanUtils implementation has a lot of features (e.g. all this DynaBean stuff). And finally Dozer: I haven’t looked at the code yet, but it seems to be very powerful. So once more it’s a trade-off between speed and features. Obviously you can’t have both so decide which one your application needs. You should only measure the time it takes to fill the bean with another. Now most of the time is spent in your test code. If you only measure a bean with ints (like the test does) you get different results compared to measuring beans that contain objects (often beans contain more objects than primitives). Hand coded simple class that uses introspection is a lot faster (3x faster) if you cache Methods efficiently and use Method.setAccessible(true). So, the results give some hint about what’s going on, but I recommend that one should not rely on those figures. you’re totally right that the tests aren’t that accurate. All I wanted to do was to give some hint about the performance for the various implementations – as you suggest we shouldn’t rely on these figures but test the performance in real applications instead for better results. Just the right info. I needed to get by. Thanks. Orika is a Java Bean mapper that recursively copies (among other capabilities) data from one object to another. It performs close to by hand. Can I have reference link regarding orika. I am using dozzer in my projects regularly. So if you can give. i would be able to think over orika. I found the project hosted at Google over here, you might want to check it out there. Thanks Christian. Yes, the project is hosted at Google. The performance is equivalent to static code and it is ease to use. It has important features like 1 to N and N to 1 relationships, try it. Does orika has capacity that convert map to javabean? please check out the user guide of Orika to find out more about this; it is possible to work with Collections in general. 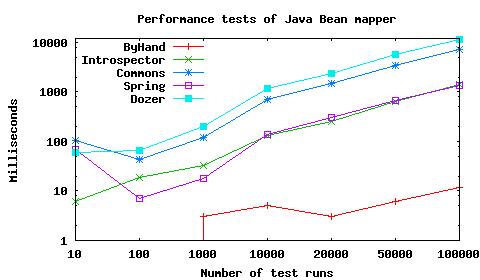 Can you include JMapper in your performance comparison? I’ve put JMapper and Orika to test and run them on my computer. thanks for the comparison and posting it here. Much appreciated!